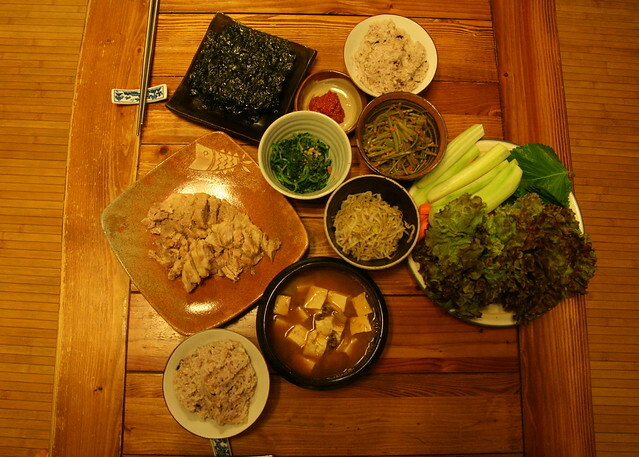 Up until last night I believed that 보쌈 (Bossam) was steamed pork. I trusted those who explained the dish to me when I first had it and I trusted that wikipedia knew what it was talking about. I'd only ever eaten Bossam in restaurants (though I have consumed hundreds of platefuls over the years) and I'd never questioned the provenance of the English translation. Last night my culinary world was rocked when my wife decided to make it at home for the first time. She knew the family recipe and when I got home she was busy putting the finishing touches to the meal. 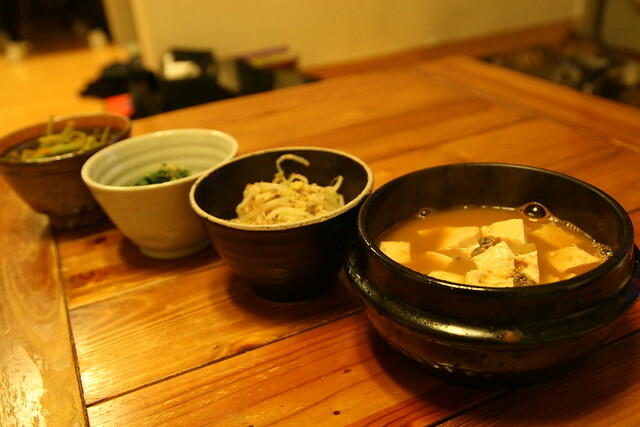 The side dishes were being put into bowls, the jjigae was on the stove and the pork was gently simmering in the pot... Wait? Simmering? Not steaming? As everything I knew crumbled around me, I sank to my knees and let out a scream of anguish. I had been lied to all this time. Bossam was not steamed, it was boiled! My wife has mean knife skills and my photography is sometimes blurry! Yay! 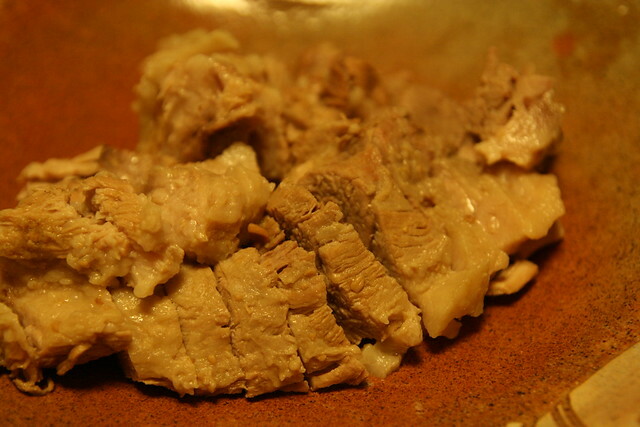 It turns out that the recipes for Bossam in our Korean books all involving boiling the meat. My wife added 된장 (fermented soy bean paste), onions, spring onions, ginger and garlic to the water and then simmered the pork for about ninety minutes or so. It gave the meat a slightly khaki tinge and tasted delicious. Side dishes were kept to a reasonable number. 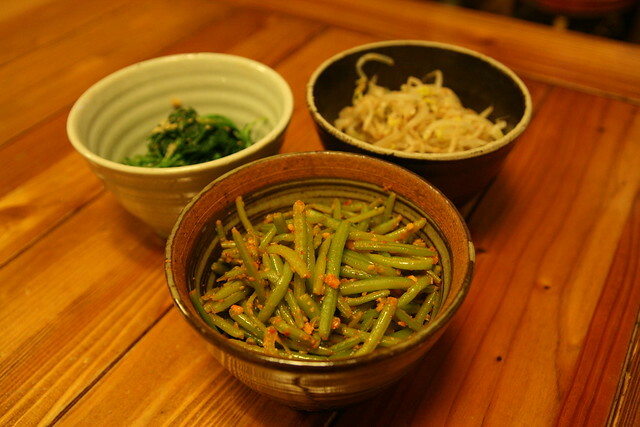 A selection of beansprouts, sweet potato shoots and pigweed (appropriate for a porky dish). 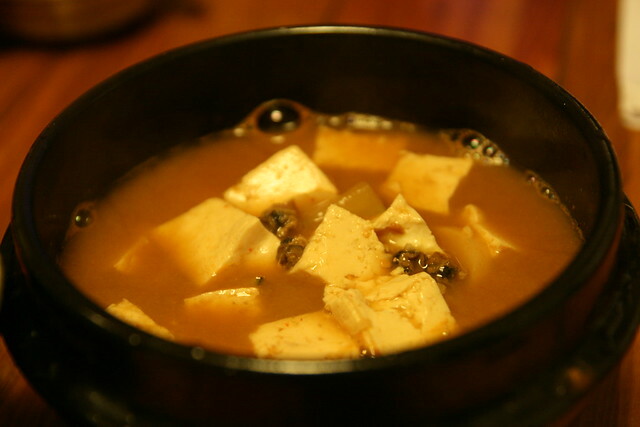 Plus the always popular dwenjang stew. It was a supremely delicious meal and worth the crushing disappointment of finding out my culinary ignorance. Unfortunately we didn't have any fermented shrimp on hand (a superb addition to Bossam), but other than that the meal was perfect. Remember kids: Bossam is boiled pork! Don't let them fool you! Not a fan of the bossam. Always too chewy and meaty tasting to me. But I didn't grow up eating pork so this kind of meat has always been a little strange to me (except bacon). However, the preparation your wife made looks yum! Thanks Joy. I think there is a very clear porcine divide throughout the world. Those who grew up loving pork and those who didn't have it as a big part of their lives. The U.K is very much a pig loving country and it would always be a regular feature on our dinner table. I love any kind of piggy goodness, but I appreciate that it's not to everyone's taste. Looking through my English language Korean cook books yesterday I noticed some more discrepancies. 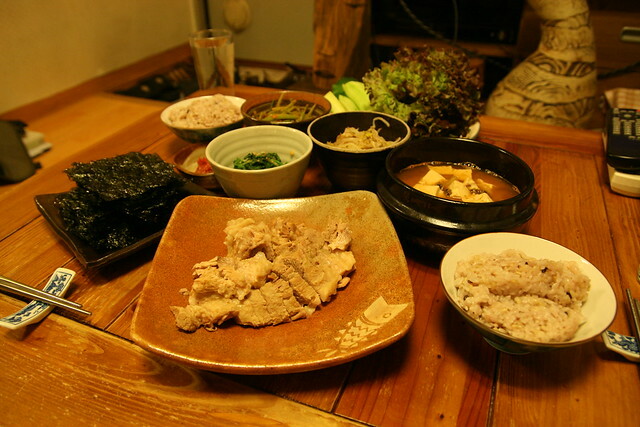 One dish was "Steamed Pork with Vegetables" (돼지고기 색찜), the recipe then went onto to describe the cooking process, telling the reader to boil the meat. The steaming only came in the last five minutes of cooking. 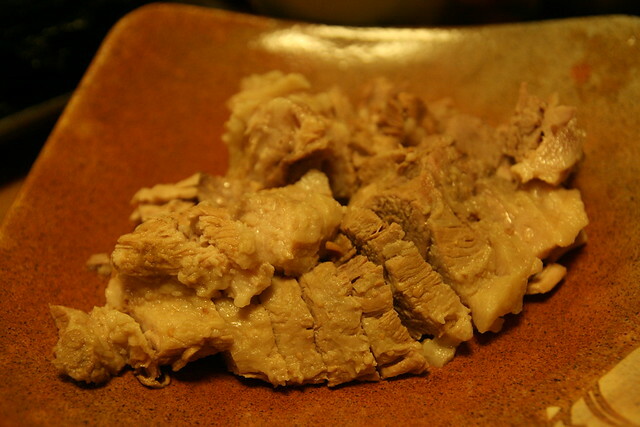 Perhaps there are similar methods used in Bossam where the pork is initially boiled, left aside and then steamed through before serving.